Progressive announced Thursday that it would within “the coming months” have its 68 Service Center facilities stop operating as a customer “drop-off/pick-up point” for auto body repairs and convert many of them instead into regional claims offices. The Service Centers offered customers a “fire and forget” option of dropping off a damaged car, having Progressive deal with the repair process rather than taking part in it personally, and picking up the vehicle when done. 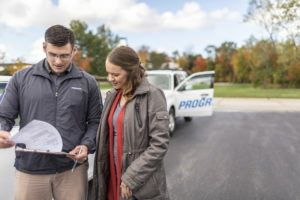 “This evolution will give customers choosing to have their vehicle repairs managed through Progressive the option of dropping off their vehicle at one of nearly 3,000 Progressive approved shops that deliver customer service and repair quality consistent with the Service Center experience,” Progressive wrote. Progressive’s limited lifetime guarantee for network shops would remain. No Service Center employees would be laid off; all will be offered claims jobs. Progressive, the No. 4 carrier in the country, reported double-digit private passenger auto growth and said its ongoing success with that insurance line allowed it to retain that staff. Progressive also said it would retain most of the facilities, converting them into claims centers. “This will enable Progressive to continue maintaining a local presence in the communities where it does business,” the carrier wrote in a news release. Allstate last summer ceased staffing drop-off locations in favor of photo estimating. Progressive described its decision Thursday simply as made “in response to shifting customer preferences and fast-paced environmental changes” and to improve customer claims convenience. A Progressive representative was looking into some of our questions about the switch. Continue to check Repairer Driven News for updates. Correction: An earlier version of this story incorrectly described Progressive’s position with regards to shops working with the company’s Service Centers. Existing Guaranteed Repair Network shops who serve the centers will remain on the DRP, but the company is not soliciting new applications from unaffiliated shops. The article has since been corrected to reflect this. Clarification: An earlier version of this article referred to Progressive closing Service Centers. The 68 locations will cease functioning as a Service Center “drop-off/pick-up point,” but many, if not all, of the physical facilities will remain open, with most being converted to Progressive claims centers. The article has since been edited to reflect this.